No more guessing what your solar energy battery charging system is doing. Add remote network monitoring capabilties to your on grid or off grid solar charge controller. See your data in a whole new light. We make it easy to web enable your charge controller. Small footprint, low 90ma power draw. DIY and get access via your browser. A cost effective solution with advanced monitoring and alerting. The Sirus Solar DS-201 is a small web server designed to interface with your Morningstar Tristar TS-45 , TS-60 , TS-MPPT-45 , TS-MPPT-60 and SunSaver SS-MPPT-15L solar charge controllers. It collects detailed data from your charge controller, enabling you to monitor system operation and performance from any internet connection. More than just a data logger, it graphs data for 24 hours, 1 week, 12 months and 5 years. It provides a monitor view to monitor your solar controllers status and solar system performance in real time with your internet browser. 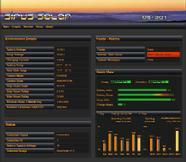 This provides for a quick view of your solar charging installation and battery charging parameters in a real-time. The DS-201 is simple to use and is an essential tool for monitoring and fine tuning your solar system to perform to its maximum efficiencies.